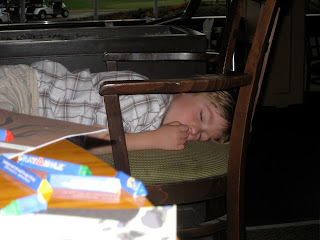 People often ask us (especially strangers in restaurants or on planes) how Big & Little C&G are such great travelers. The simple answer is that I think it's because they've always been doing it. We've taken them out to restaurants ever since they were little. It hasn't always been easy, or fun, but we've done it. The payoff is that they've learned a very important lesson from a very young age. They are expected to behave in public. It was a lot of hard work at the time and I remember there being plenty of tears (usually from me). But the end result is that they're now 12 and 10 and they can pretty much go anywhere. Restaurant menus can sometimes pose a challenge. They might not always be happy with the offerings, and there have been some tears shed over what they're going to eat. But I've learned that well mannered children can usually charm the restaurant staff into finding them something a little more to their liking. And if not, make friends with whomever is in charge of refilling the bread basket. 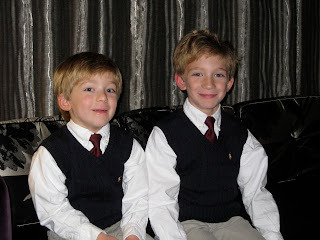 When the boys were younger, one of us would eventually end up walking the halls or the lobby with one of the misbehaving kiddos while the other parent relaxed with a bag of cheerios and a cocktail (guess who got which). Now that they're a little older it has become a whole lot easier. We've never allowed electronics at the table, no matter how desperate the situation seemed. I feel very strongly that video games and movies have absolutely no place at the table. As long as there are paper, crayons, and a toy or two they're pretty happy. 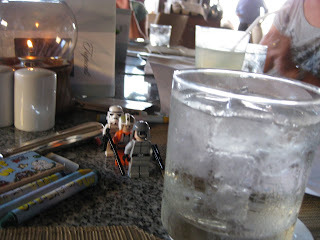 It is asking a lot for them to stay at the table (or in the lounge during cocktails) while the adults are having fun. So we do let them bring an action figure or two, which will keep them occupied for quite a long time. I'm assuming it's the same with girls and dolls. And if I'm feeling really generous I might bring an new Lego mystery minifigure for them to open and play with. But once the food starts to come to the table, all the toys get put away till after dessert. We're very lucky to have a lot of wonderful restaurants here in Portland for the boys to "practice" in. With several James Beard Award nominees and winners, Portland's food mecca reputation is well deserved. There's such a laid-back vibe everywhere that I honestly can't think of a place that wouldn't welcome kids. So pack up your crayons, action figures, barbie dolls, and get out there. And don't forget to order cocktails!